Attukal Pongala 2016 Live Streaming can be watch through the official website of Amrita TV. Amrita TV Malayalam Television Channel will air the live coverage of Aattukal Pongala 2016 on 23rd February 2016 at 9.30 A.M to 10.10 A.M and 1.20 P.M to 1.40 P.M.
Attukal Pongala 2016 date is Tuesday 23rd February 2016, every year record numbers of ladies are coming for this ponkala festival. You can watch the live streaming of Aatukal ponkala from here, please check the time of telecast and you can watch the same from here. Please be remember that this is the official website streaming of Amrita TV.You can watch the ponkala telecast live through almost all popular malayalam channels like Kairali TV, People TV, Asianet News, Manorama News, Reporter TV, Mathrubhoomi News etc. 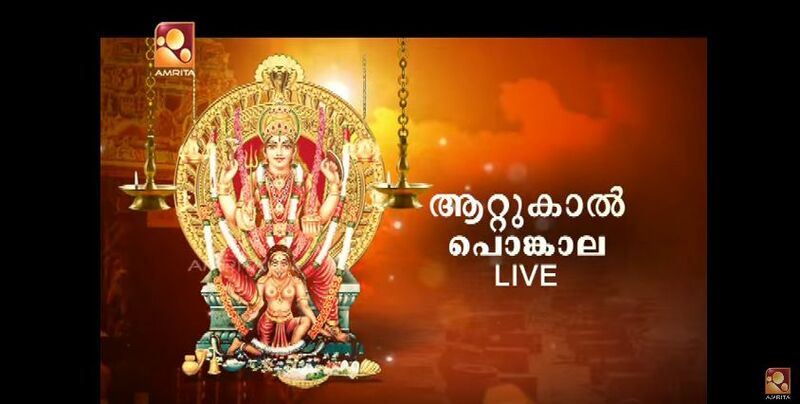 Every year Amrita TV is showing the Live Coverage of Aattukal Pongala Live. Millions of devotes are watching the same through television.